My name is Heather Nemeth. 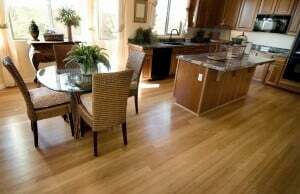 I really want to give testimony of how Advanced Hardwood Floors did amazing work in my floors. I had the most horrible floors ever. I couldn’t invite anyone to my home. It was really unpleasant how I used to feel. One day I said no more, I want to fix my floors. 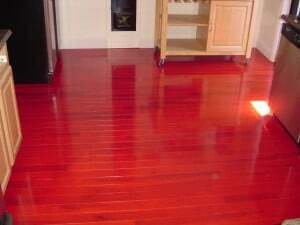 I contacted Joe from Advanced Floors and he and his crew magically gave me the most amazing wood floors I ever had. I am very happy. I will definitely use them again and I recommend for whoever out there has the same situation I used to have. Thank you, Joe, thank you for amazing detail work you did to my floors. Very, very pleased at the work done by Advanced Hardwood Flooring. I was a little hesitant since I found them through a generic Google search. After my due diligence with BBB, and the other reviews, I took the chance. They brought my floors back from the dead! I can see my reflection in them. Beyond thrilled!! The professional and courteous staff was on time and did the job exactly to scope without any issue. I highly recommend this company. We recently had an addition done to our home and some interior revisions (walls removed ) in the original portion of the building. 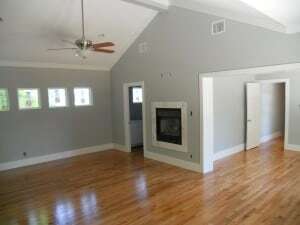 We needed a 30 foot section of floor which had been two rooms to match creating a great room. Looking at it we decided to continue the floor through the kitchen and into a portion of the living room for continuity. I called a number of flooring companies including Empire (don’t waste your time). Joe Palumbo of Advanced Hardwood Flooring was the only one who showed up when he said he would. 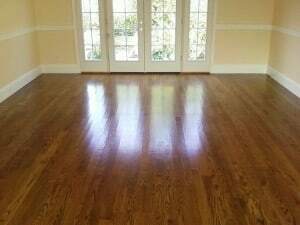 He provided me the best price for #1 select red oak flooring/staining/and polyurethane finish and was happy to supply references and testimonials through his website. The material was to be delivered two days after contracting at 8:30 in the morning and it was. His installation team also showed up on-time, ready to work. They were hardworking, courteous, skilled and protective of my home. 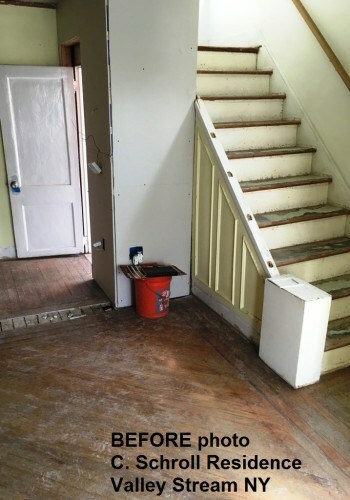 The original portion of my home is 100 years old and there were some issues with level subfloors, pitch of floors etc. 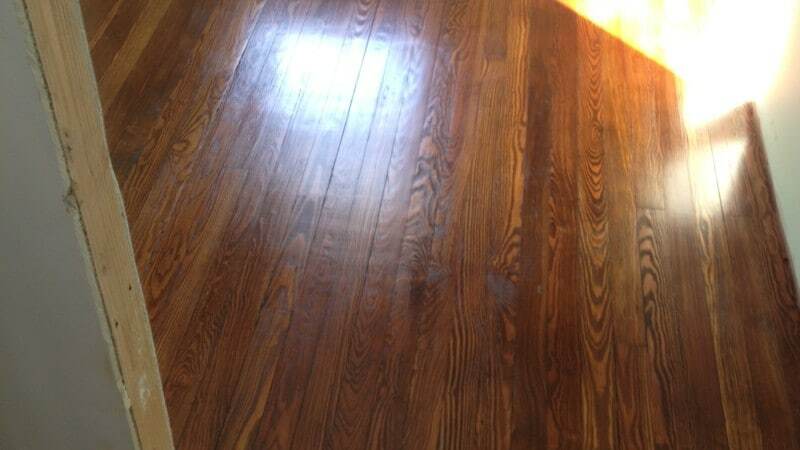 This was handled with ease and experience and the floors came out beautiful. Joe Palumbo, the owner, came and applied the polyurethane finish himself over two days and the results were magnificent. It looks like a new gymnasium! A few days later while moving the refrigerator back into place we scratched the floor. I called Joe to see if he could possibly touch it up. 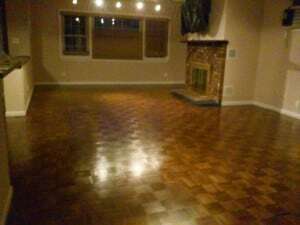 He came the next day and buffed it out and reapplied the poly, the floor looks fine and there was no charge!! I cannot say enough nice things about Joe and his work. 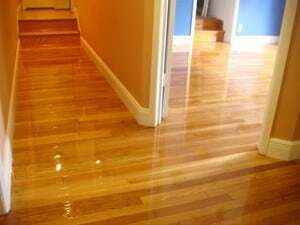 If you need hardwood floors installed or refinished Joe is your guy. Best Price and Best Workmanship. 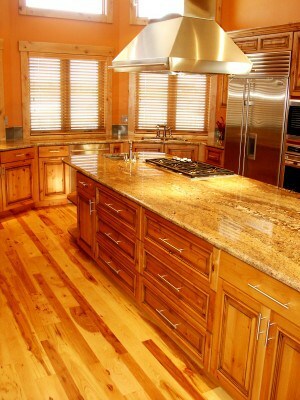 Advanced Hardwood Flooring is a great, family owned business. Joe Palumbo and his guys are polite, professional and took the time to explain all of our flooring options. Great Job! Thanks! I just want to thank you for the outstanding job you and your crew did in refinishing the hardwood floors in my apartment. The service you all provided from start to finish was top notch. 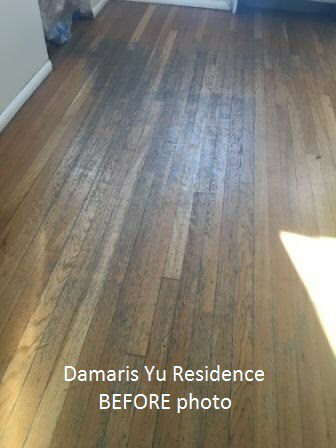 I am extremely pleased with the way the wood floors look and you have literally transformed my apartment with the great job you have done. 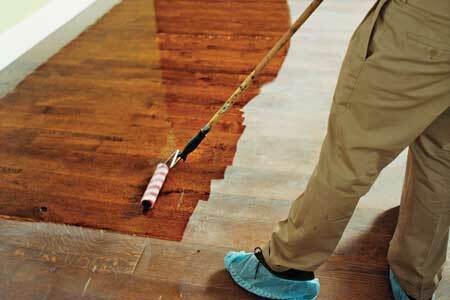 I also appreciate your help in selecting a perfect stain for the wood floor to complement the style of the rooms. You are true professionals and I would recommend Advanced Hardwood Flooring to anyone who needs help with hardwood floors. I would be remiss in not taking the time to formally thank you for the superior workmanship and professionalism that you and your workers displayed while completing my hardwood flooring needs. 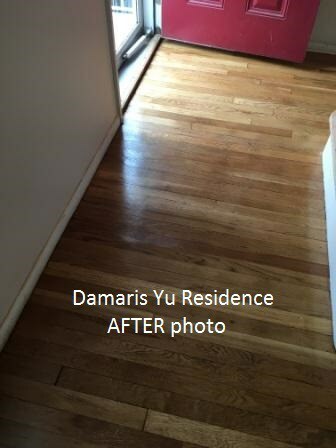 I was thrilled that the new wood floor you installed was integrated so well with the existing floor. 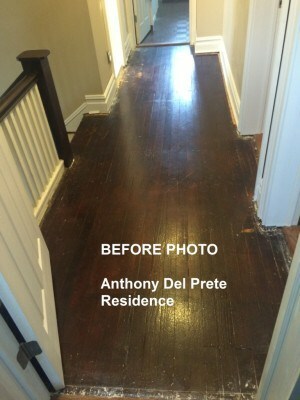 The staining and refinishing of the rest of the wood floors throughout the house was picture perfect. Best of all, you called when you said you would call and you showed up when you said you would show up. 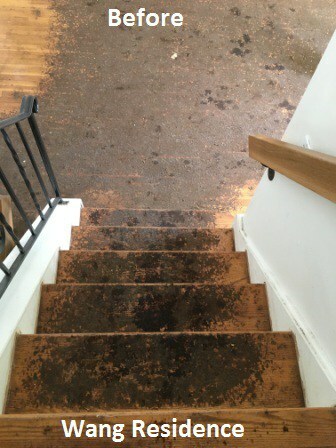 My husband and I have been through this wood floor refinishing routine in four different houses. Never have we been so pleased with the results and all levels of service. I met Joe last year when I purchased my first home. Joe helped me pick out the layout and colors for my floors. I was very impressed with Joe’s diligence and follow through with every step of the process. I always felt that Joe was working with me rather than just doing a job. 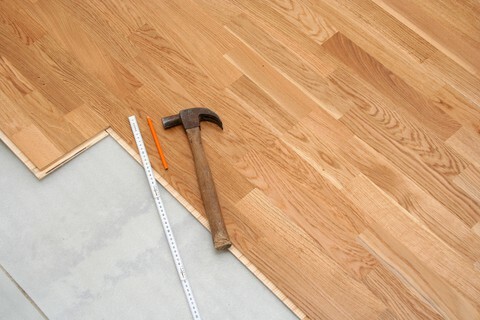 I have since relied on Joe’s expertise and knowledge for flooring and his up most professionalism. I know when I am dealing with Joe I am getting nothing but honest answers and quality workmanship. Joe, I can’t thank you enough for such a great result. It was a pleasure to come home and find my old, worn out and abused hardwood floors restored so beautifully. The wood floors had been neglected for so long prior to us buying this house that I was skeptical of the results you promised. In the end my expectations were definitely exceeded. Your assurance and confidence put us at ease. You and your team took great care not to damage any of the newly painted walls (thank you). You completed the project on time and budget. Overall a great experience. And here we are, 5 years later and my gorgeous hard wood floors are still stealing the show. It is the single most acknowledged/complimented feature of our home. It has been our pleasure to refer you to all of our family and friends. Thanks again for such great service and results. We are extremely happy with the job done by Joe Palumbo and Advanced Flooring Inc. As a non-profit volunteer organization it was important to find someone who could fulfill our flooring needs and be very affordable at the same time. This is what Joe and his team offered us! The job was done in the time period promised and the quality of work is top notch. 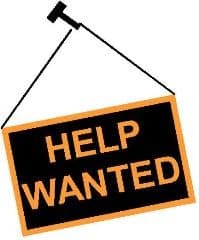 I would highly recommend Advanced Flooring to anyone who is looking for new flooring or refinishing. 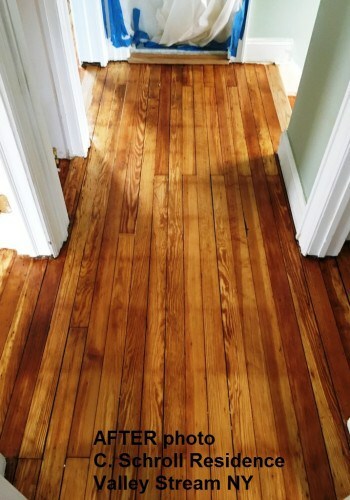 Just a short note to express a large thank you for the great job that you and your company did on my hardwood floors. The floors are beautiful and both my husband and I love them. 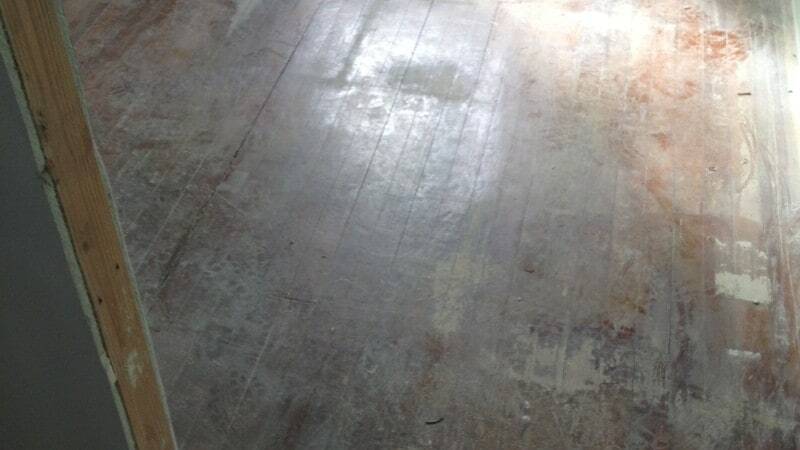 Sanding hardwood floors is always a big, messy job in a house that is already lived in, but I must say that your workers handled everything very well. They were neat, courteous and efficient. 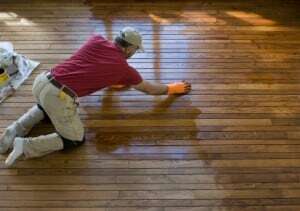 Having your hardwood floors done can be likened to giving birth to a baby, i.e., there is “a lot of crazy stuff” going on at the moment, but in time all you see is the beautiful creation! 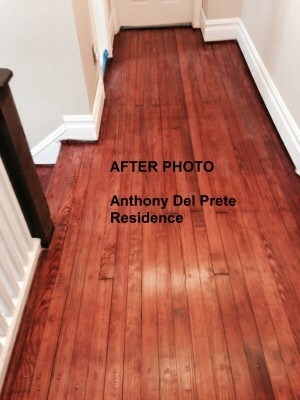 Advanced Hardwood Flooring did an excellent job refinishing all of the floors in our Massapequa Park home. 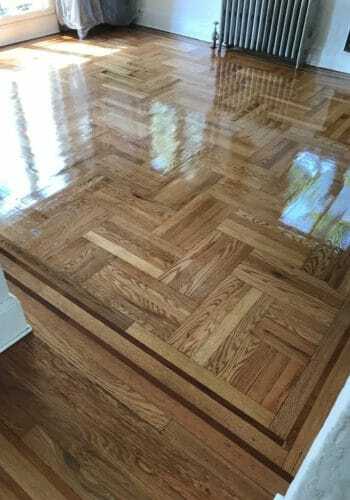 Joe’s work is meticulous and the floors look fabulous. What a difference! 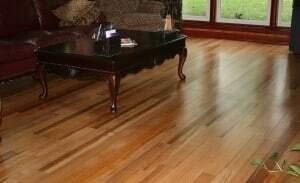 We highly recommend this wood flooring company to anyone looking to put in new hardwood floors or refinishing existing wood floors. We worked directly with Joe, the owner. He was prompt and professional every step of the way. And, his eye for color and design is terrific as well. Joe’s pricing was more than fair, the job was completed on time as promised! Shop around if you must, but make sure you speak with Advanced Hardwood Flooring before deciding on any other wood floor contractor… You’ll be so glad you did. We recently ripped up our carpet and had our floor refinished by Advanced Hardwood Flooring and they did a beautiful job! 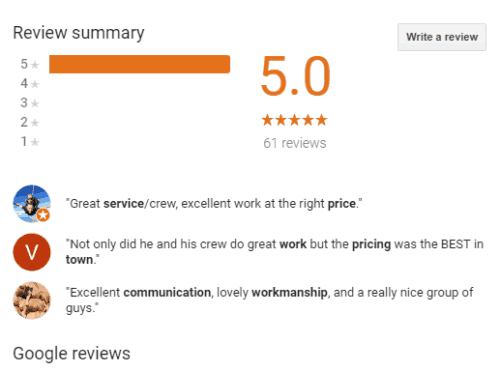 Joe came in and gave us a free estimate, was always on time and very accessible whenever we called him with questions. He was very knowledgeable about wood floors and an expert at his trade. He offered me great advice on the color of stain and I could not be happier with the result. 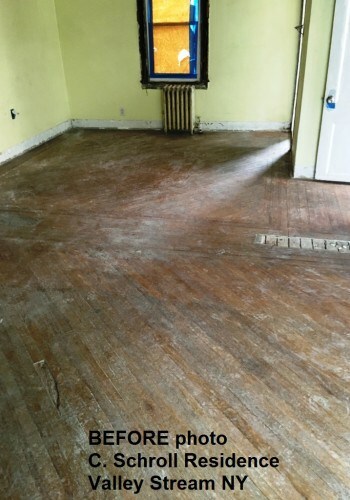 They were able to get out pet stains on the 50 year old wood floor, were very respectful of our home and left everything as clean as they found it. 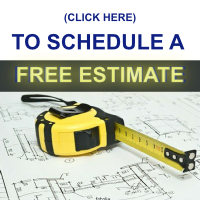 I have had other work done on my house by general contractors, but its so nice to work with a company that are true tradesmen and experts at what they do. And even more they offer a great value. I highly recommend this trustworthy family-owned and run local hardwood floor business. 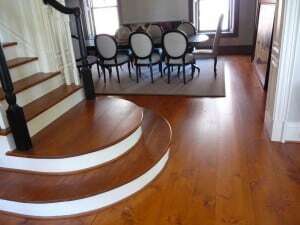 I recently had my floors done by Advanced Hardwood Floors. My wood floors are now a work of art. I am elated how many compliments I have been getting on my new wood floors.. This was superb craftsmanship and detailed work. The owner of the company, Joe Palumbo, gave me time, patience, answered every question and concern I had with a smile as well in great detail. I was shown samples and color charts which made me feel at ease with this preparation. Once again I want to thank Advance Hardwood Floors and their amazing wood flooring specialists who made my house look new again. 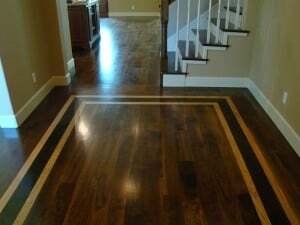 I just wanted 2 send a very satisfied shout-out for Advanced Hardwood Flooring! the years of abuse (baby walkers, toys, etc. 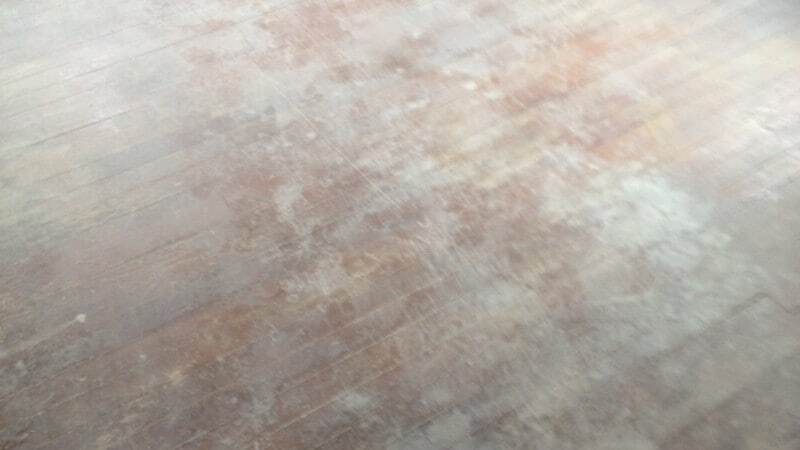 )…the wood floors still look pretty good. 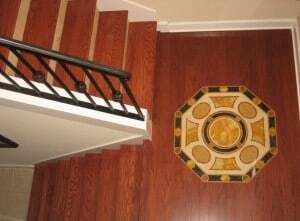 I am writing because I feel compelled to compliment you on so many aspects of the service Advanced Hardwood Flooring company recently provided in my home: I didn’t believe it would be, but it was. There was very little clean up after your crew was finished. Your guys were great. Very polite, I wasn’t nervous having them in my home. I always felt like the most important customer you had. Thanks for taking the time to explain the whole wood floor process to us. You kept your word and the job was complete as you promised. 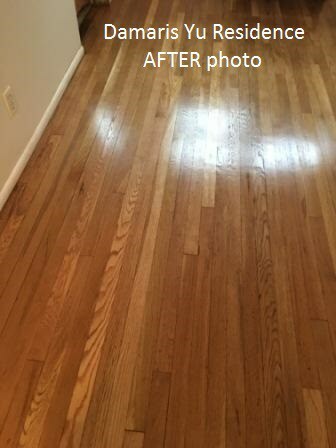 The Finished Product — The most important thing of all was the finished hardwood floor. It looks fantastic. I was really very nervous about having this work done, but I am so thrilled with the results. The wood floor is beautiful, and even over 3 months later, holidays and all, the shine on the hardwood floor still looks brand new…and I have a German Shepherd! Just wanted to take a minute to let everyone know about Advanced Hardwood Flooring. They came in and refinished all the wood floors on the whole bottom level of my house a few months ago. My husband and I were very impressed with the professionalism this company displayed, starting with returning phone calls, to clean up and not to mention the beautiful craftsmanship they displayed thru their work. 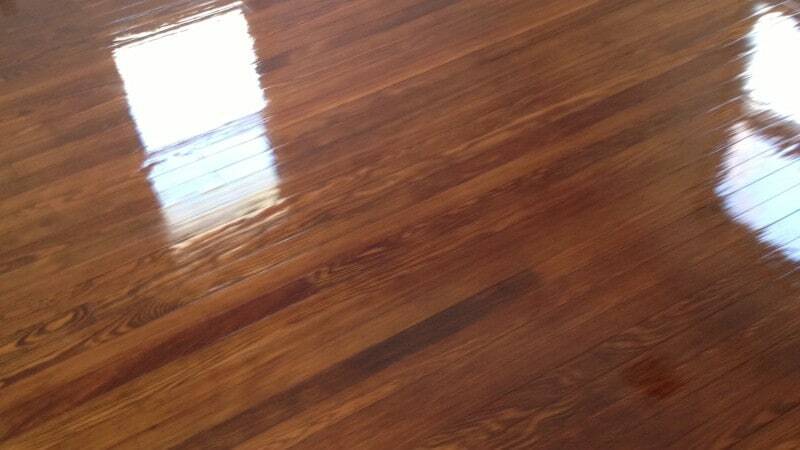 I would highly recommend them to everyone I know who needs hardwood floors refinished! It was definitely a pleasure to have them work for us! 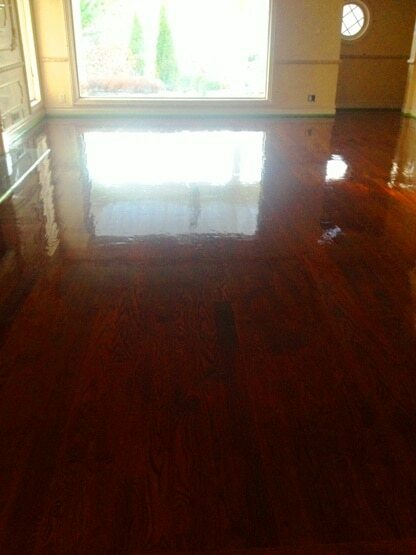 It is our pleasure to recommend the services of Joe Palumbo and his company, Advanced Hardwood Flooring. My wife and I chose to use Joe’s company because of his professionalism and high standards, and we could not be happier with the results. From the beginning of the process Joe showed that he cared about giving us excellent service and advice. He took the time to explain our options fully and help us choose a floor color and finish that would work best with our home and lifestyle. After showing us the samples of our choice, he assured us that he would be happy to come back and show us more if we desired. As a result of his patience and conscientiousness, we made the perfect choices. Furthermore, he and his team are punctual and exceptionally courteous, which made working with them a pleasure. Our faith in Joe and his team paid off. 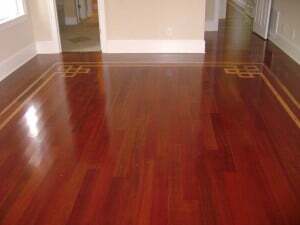 We are delighted with the beauty of our refinished hardwood floors and by how much they enhance our home. 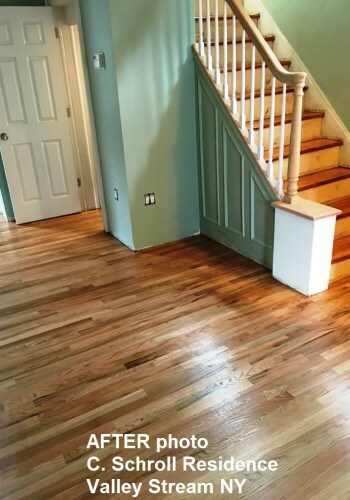 All of our friends and family who have seen our wood floors have commented on the high quality of Advanced Hardwood Flooring’s work, and some of them are already considering using Joe and his team for their own future projects. 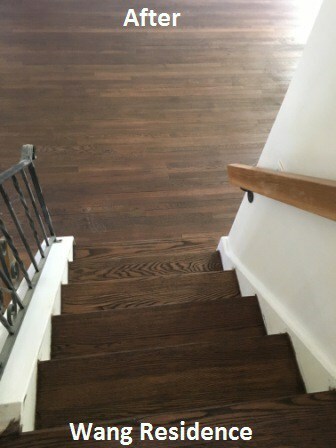 We are grateful to have worked with a company like Advanced Hardwood Flooring that believes in providing an outstanding service. We would definitely use them again. 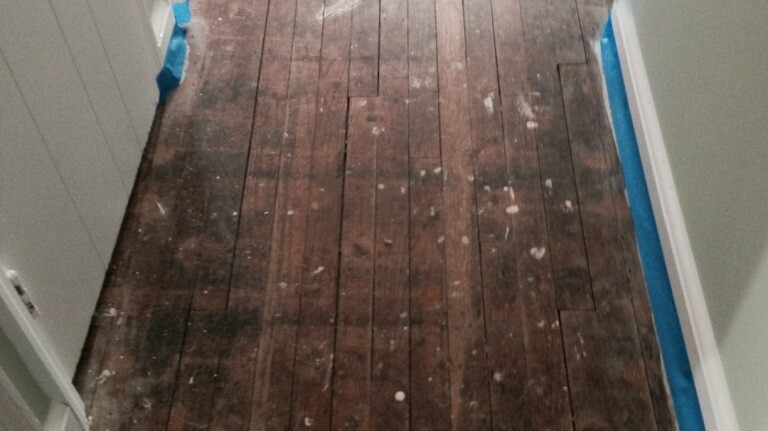 I recently pulled up the carpet in my living room to reveal 98 year-old hardwood floors I never knew were there. 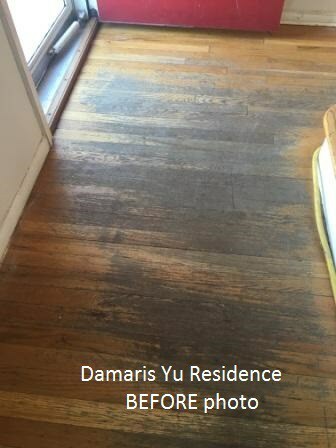 The design on the worn wood floors was beautiful but most of the floor was covered in a carpet pad that had cemented itself to the floor over the past several decades. After days of unsuccessfully trying to scrape and sand the stuck pad from the hardwood floor I was ready to give up and just re-carpet the room. But before I did I decided to give Joe a call. He was in my home less than an hour from my first phone call, gave me a very reasonable quote in minutes, and started working on my wood floor a couple days later. 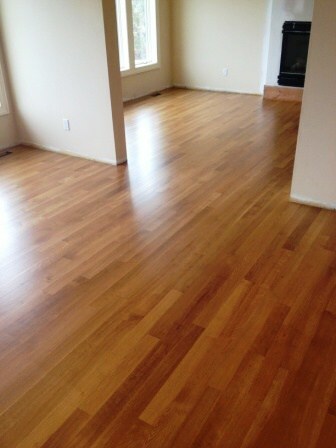 I could not be happier with the job Joe and his team Advanced Hardwood Flooring recently completed on my home. 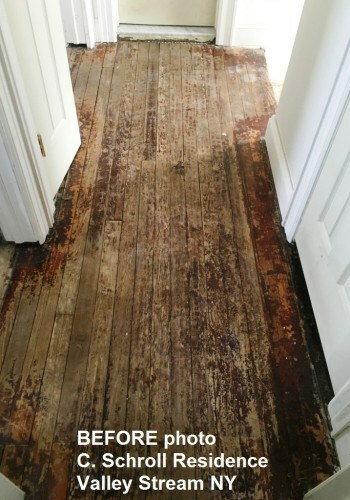 In addition to getting rid of that pad, they took care of some water damage in my dining room, and restored my bedroom and hallway wood floors to a gorgeous finish. In a few days my floors went from being the worst part of my house to being the best part of my house. Thanks again Joe. 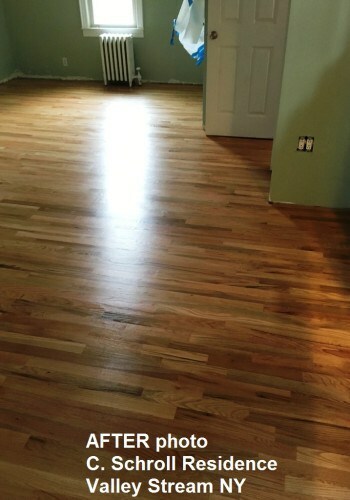 Nick and Joe Palumbo, my family and i want to thank you so much for the hardwood floor refinishing job you did for us at our grandparents house in Brooklyn. 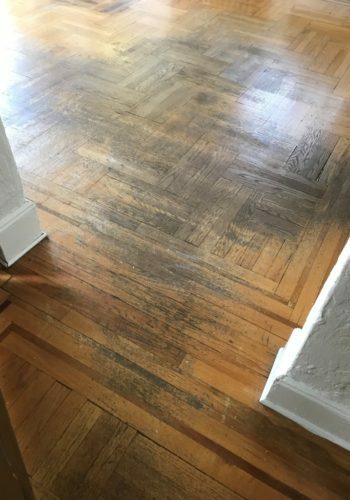 We never thought those old wood floors could ever look like the pictures we showed you from 70 years ago…..the work you and your employees preformed was wonderful. i also greatly appreciated that you stuck to your time schedule that I had minimal to no clean up after the job was done. yours truly, a definite repeat customer. – Anthony Cataldo, Brooklyn NY …… p.s., i included my address so you can send me some of your business cards. 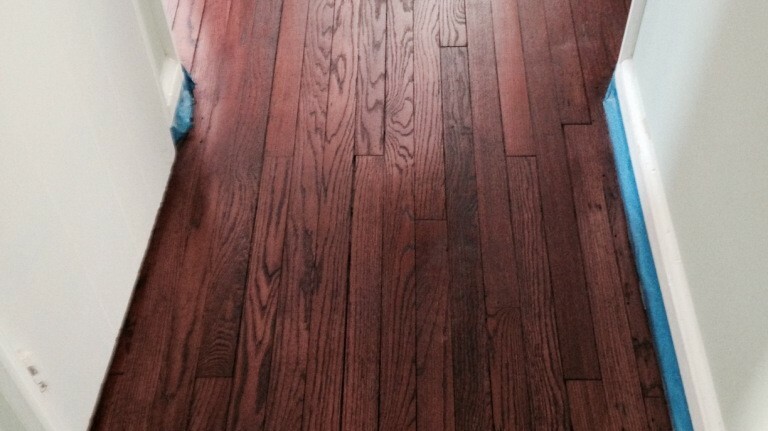 I highly recommend Advanced Hardwood Flooring, for several reasons. The owner, Joe Palumbo, is professional and flexible. He conducts his business with integrity – always responding to e-mails and phone calls in a timely fashion. The men on his crews arrived on time, were polite, neat and did a thorough job. This company will be my “go to” flooring company as I continue to restore and redecorate my home. Joe and his team did a phenomenal job refinishing our stairs and second floor landing. After moving into our new home, my wife and I ripped up old carpeting from the stairs and upstairs hallway. Under the carpet and padding was 100 year old pine (scratched up, worn down, and someone even painted the wood going up the stairs-it looked like someone had a runner up the stairs and painted around it!). Initially, my wife and I contemplated if this wood was even going to be able to be saved. Considering I hate carpeting, I looked into every other option available. After coming across Advanced Hardwood Flooring on Google, I decided to give Joe a call. From there on out, I knew these were going to be our guys. 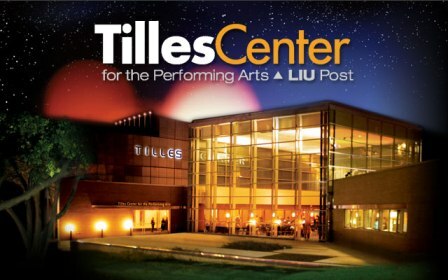 Very professional, courteous, attentive, and just an all around excellent experience with them from day one. The stairs and hallway came out way better than my wife and I even expected (this wood was in rough shape). 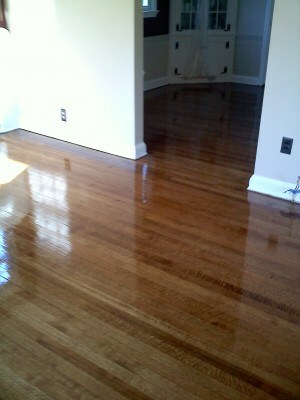 We could not be more happy with Joe and his team and highly recommend them to anyone looking to refinish their floors. 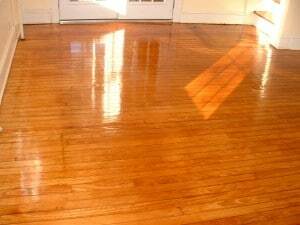 Refinishing hardwood flooring in Bellmore, Merrick, Seaford, Wantagh, Massapequa, East Meadow, Westbury, Glen Cove, Roslyn, Great Neck, Mineola, Garden City and many other fine towns on Long Island New York, NY for over 60 years.